Just think – as Facebook continues to gather more data on its users, inactive Facebook accounts like mine will receive “targeted” email in their inbox via non-published email addresses like mine below. What’s odd about this email is it was sent to an address which is only published in one single and exclusive offline printed directory. There are no online versions of the directory nor is this particular email published anywhere else. The spammer assumed I had an active Facebook account and that somehow the odds of my having a Facebook account were great enough that they could convert their spam email into a “fan” of their group. 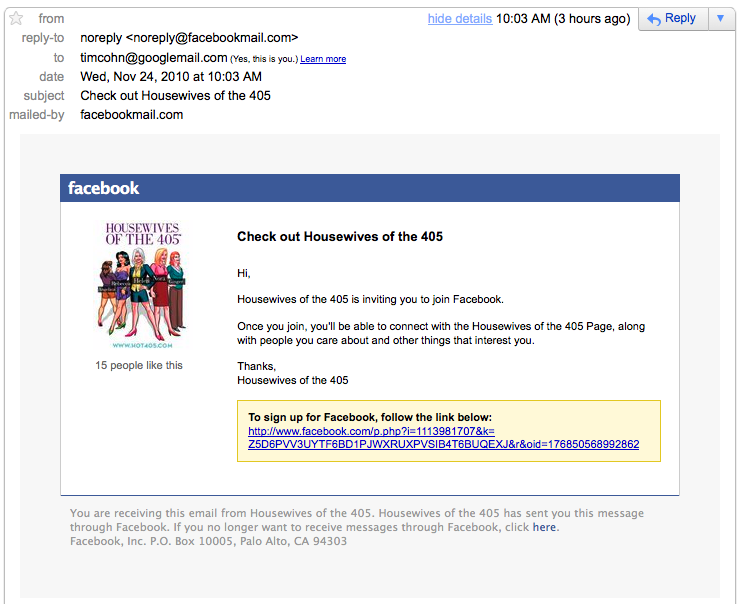 This entry was posted on November 24, 2010 at 1:46 pm and is filed under Location Based Spam. You can follow any responses to this entry through the RSS 2.0 feed. You can leave a response, or trackback from your own site.